meta_creation lab is a collaborative space to creatively explore the relationship between improvisational/real -time performance practices, computation and networked collaborative creativity. meta_creation lab is an open space for exploration of the use of procedural strategies as dramaturgic games to dynamically activate the spaces with rule systems that are executed in the moment of performance (generativity). meta-creation lab investigates bottom-up architectures for performance as design and dramaturgic strategies to develop "rhizomatic" spaces for non-linear dramaturgies. meta_creation lab investigates and develops participatory systems as performance games combining computational and hybrid (human/machine) instructions used as "scores" or generative algorithms. meta_creation lab develops spaces as a cognitive system where the performance composition emerge. meta_creation lab explores the relationship between aspects of contemporary internet culture and experimental performance practices and its aesthetics such as: open source source software and choreography, gaming, sampling and recombination, data flows, mashups and remix culture. meta_creation lab explores the embodied/distributed cognition approach to frame physical activities and movement games (scores). meta_creation lab explores the dramaturgic potential of ubiquitous networks, data flows, post-PC technology and real time interaction. meta_creation lab explores the constraints and affordances of new performance methodologies and conditions derived from our embeddedness in socio-technological discourses and systems. meta_creation lab presents contemporary relevant artists and their propositions to illustrate, generate dialogue and prompt creative activities. This workshop ends with a durational open showing as an installation/ performance where the space is activated by participants and visitors following the same scores and games. All participants and visitors are given the score in writing. 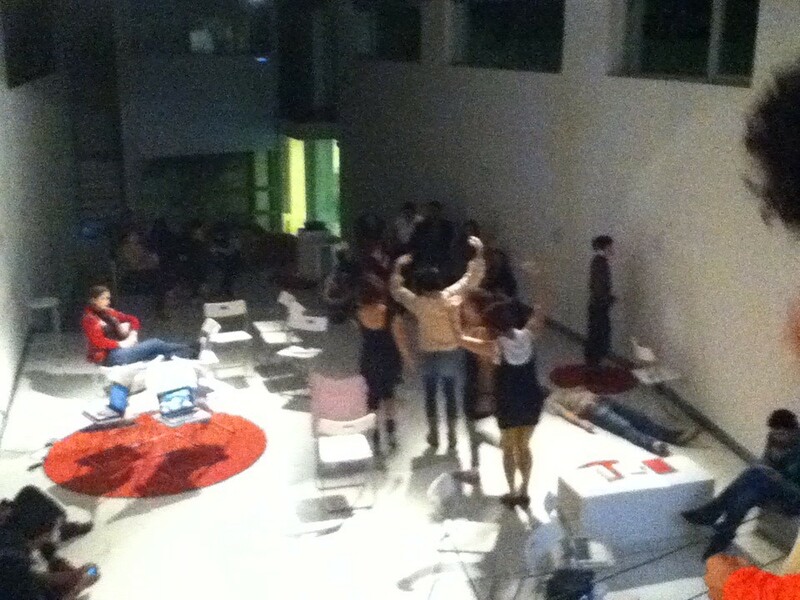 The space can be left as an installation for a longer time and may be activated by the visitors following the score created during te workshop. dancers, choreographers, visual artist, musician, media artists, performance artists, architects, cultural managers, journalist, writers, etc. This is a collaborative creation workshop and some instruction on specific software or applications are offered as modules based on interest. Most of the software to be used is available in the internet for free and will be provided. Participants are encouraged to bring their portable computers and tablets. Bottom-up architectures of generative systems. Performance, rule systems and algorithms. New Internet technologies (web 2.0) and collaborative creation. Embodied and distributed cognition and compositional implications and potentialities. Post-pc technologies apps, tablets and mobile technologies. Introduction to Real-time processing of video and sound. Life logging and creative process. Hybrid realities and alternative performance sites. Locative media/Mobile and urban exploration. Computer aided choreography and algorithmic composition. Portable hardware as interfaces/interactive media control. Social media for distributed creativity and knowledge production. Contemporary Performance and new media video playlist (what is out there). Participants will be offered audio visual and reading references. Personal Accounts in Facebook, Twitter, YouTube and dance-tech.net are necessary during the workshop. Participants are encouraged to bring comfortable clothing (willing to move) and to bring their own laptops, photo and video cameras and smart phones. All the documentation will be developed by the participants. Some equipment is provided but the main goal is to generate autonomy and empower the participants to use their own equipment and develop the knowhow after the workshop ends. Designed for a max of 16 participants. A co-facilitator is necessary for more than 16 participants. Dance or performing arts rehearsal/performance space with linoleum floor with no mirrors. Possibility of making the space dark and manage lighting conditions. The best connectivity available for a media lab setting to allow multiple users on line working with video. Two white boards and markers. A open wall in the room for posting. tape in at least three different colors. Possibility of leaving things stuck in the walls and boards. Masters in Performance Practices and Visual Culture, November 2011, Madrid, Spain. Takween Collective October 2011, Beirut, Lebanon.